Whether your strip door requires special hardware like a rolling mount, gate hinge, or a more standard option like our universal mount hardware, our customer service representatives are ready to help find the ideal solution to suit your needs. 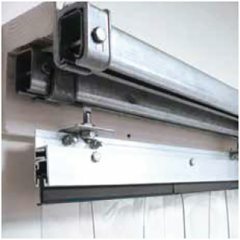 With rolling mount hardware your door will have the versatility to slide out of the way to one side or bi-parted to either side when not needed. 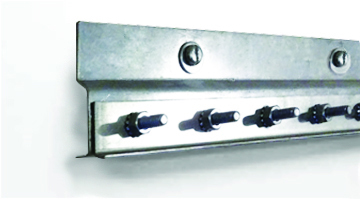 Our frame-in mount hardware is designed to allow your strip door to be mounted around the track of your door, protecting your investment from vandalism and extended exposure to sunlight. 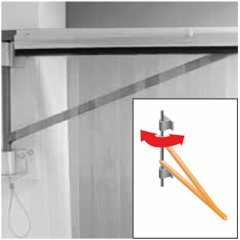 Allows the strip door to be swung out of the opening when not required. A Retractable bolt locks the hinge in place. The In-jamb mounting method is ideal for sectioning off parts of a room or when there are obstructions on the perimeter of the doorway. This mounting style has a few limitations due to the lack of an overlapped edge, the small space created at each end allows ingress of some air and other variables that would be covered by a face of wall mount. Due to this an in-jamb mount should only be used when necessary. 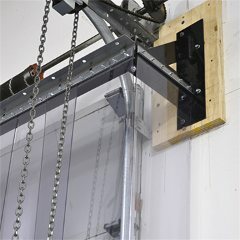 The face of wall mounting method, also known as a surface mount, flat wall, or flush mount is the ideal method of installation for your strip door. Intended to be mounted so the seal extends past the opening on either side, the face of wall mount ensures a more effective seal than the optional in jamb mount. This method requires a clear, un-obstructed wall space around the opening. (Optional) strip doors using a face of wall mount can be ordered with orange strips on each end at no additional charge. 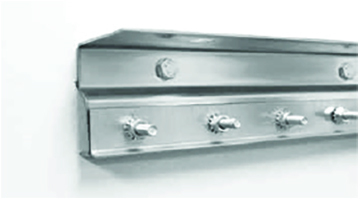 Available in both aluminum and galvanized steel; price varies by material.